SÃO PAULO, BRAZIL – The government’s announcement of the new phase of Brazil’s housing program, Minha Casa, Minha Vida (My Home, My Life), turned into a pro-Rousseff rally on Wednesday as social movements interrupted officials several times during ceremony chanting “There will be no coup”. Brazil’s announcement of the new phase of the housing program, Minha Casa, Minha Vida (My Home, My Life), turned into a pro-Rousseff rally, photo by Antonio Cruz/Agência Brasil. Amidst the worst political and economic crises in the country recent history, Brazil’s federal government launched the third phase of its much-acclaimed housing project calling for the construction of another two million units by 2018 at a cost of more than R$210 billion. Yet guests at the ceremony were less interested in the housing sector and more interested in protesting against the impeachment discussion taking place at the Chamber of Deputies this week. “Impeachment without the crime of fiscal responsibility is what?” asked President Dilma Rousseff to a crowd of rowdy supporters. “It is a coup,” she answered. The crowd was made up of members several social movements, such as the MTST (Homeless Workers Movement) and the MST (Landless Workers Movement), which have traditionally supported the PT (Workers’ Party). 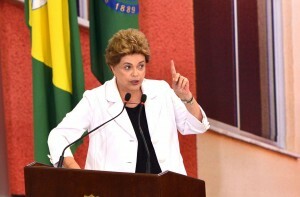 “Those who want to interrupt a legitimately-elected mandate, through illegal instruments, will be responsible for delaying the recovery of economic growth and job generation,” said Rousseff. President Rousseff is currently struggling to maintain power as her biggest ally, the PMDB party moves away from the coalition and heads to talks with opposition parties. Accused of mismanaging and manipulating public finances and losing political support from allied parties, Rousseff’s impeachment is increasingly more certain by political analysts here in Brazil and abroad. If impeached Brazil’s Vice President, Michel Temer, from Rousseff ex-ally PMDB party would take over until 2018. “We are fighting for more rights, more inclusion, more jobs, more growth and more democracy,” said the President as the crowd roared with approval.